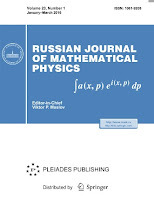 The Russian Journal of Mathematical Physics, a peer-reviewed periodical, deals with the full range of topics subsumed by that discipline, which lies at the foundation of much of contemporary science. Thus, in addition to mathematical physics per se, the journal coverage includes, but is not limited to, functional analysis, linear and nonlinear partial differential equations, algebras, quantization, quantum field theory, modern differential and algebraic geometry and topology, representations of Lie groups, calculus of variations, asymptotic methods, random process theory, dynamical systems, and control theory. 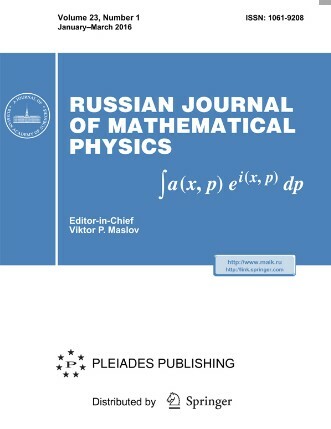 The Russian Journal of Mathematical Physics focuses on original papers with full proofs, but also publishes brief communications and state-of-the-art reviews. In addition to purely mathematical papers, the journal is hospitable to theses with less rigorous, or “physical,” levels of proof, which are sometimes useful and lead to major advances in science, as well as to analyses based on the heuristic or speculative approaches (at the discretion of the editors). Now-declassified classic papers will also finally see the light of day. The Russian Journal of Mathematical Physics is international in scope, and invites papers (in English) from mathematical physicists everywhere. It hopes to serve the needs of the international mathematical community, and to that end the Editors invite suggestions from interested readers. Academic OneFile, Astrophysics Data System (ADS), Chemical and Earth Sciences, Current Contents/Physical, Gale, Google Scholar, INSPEC, Journal Citation Reports/Science Edition, Mathematical Reviews, OCLC, ReadCube, SCImago, SCOPUS, STMA-Z, Science Citation Index Expanded (SciSearch), Summon by ProQuest, Zentralblatt Math.